Catalog Home > Classroom Collections > Super Power! Organize your classroom in a time-saving fashion by using personalized desk nameplates to create a welcoming environment. The 36-piece pack of Super Power desk nameplates will make it easy for you to manage classroom seating and for students to find their place. Desk nameplates add a personal touch to otherwise plain desks, and your students are sure to appreciate them! 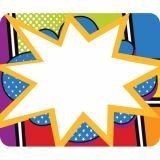 Energize your learning environment with the Super Power collection! 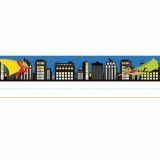 Featuring a fun superhero design, these nameplates deliver the perfect way to personalize your learning environment. The 40-piece pack of Super Power name tags offers a convenient way to label storage boxes, notebooks, and folders. Versatile by design, these name tags can also be passed out at open houses and field trips for identification. Energize your learning environment with the bold and colorful Super Power collection. The Super Power name tags offer a simple way to identify participants and organize classroom items with style. An easy way to stay organized during open houses and field trips, name tags are a must-have for every teacher. These organizational tools can also be used for labeling storage boxes, cubbies, folders, and shelves. This pack comes with 40 self-adhesive tags (3" x 2.5"), each featuring a vibrant Super Power design. Be sure to add other coordinating products to create a cohesive classroom theme! Accent curriculum displays or highlight classroom decor with affordable and versatile borders. The Super Power Rainbow Dots scalloped border provides an easy, time-saving way to add style to your learning environment. Cut and layer this fashionable scalloped border to accent windows, doors, or bulletin boards with style that lasts all year. Create a learning environment that energizes and empowers with the Super Power collection. 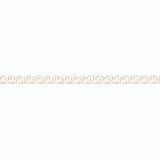 The Super Power Rainbow Dots scalloped border features colorful polka dots on a white background for a vibrant design that complements your Super Power décor! Curriculum-based bulletin board sets offer a time-saving solution for helping students build essential skills through visual reinforcement. 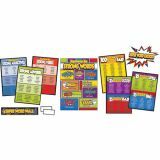 The 43-piece Super Power Super Word Choices bulletin board set offers suggestions for building a stronger vocabulary. Content-rich decor enhances the learning process by reinforcing the lessons necessary for academic success. Curriculum-based bulletin boards sets are the perfect solution for classrooms with limited display space. These convenient sets allow you to create a fun and inviting atmosphere while presenting essential standards-based content in a visually appealing way. Curriculum-based bulletin board sets reinforce important skills and learning strategies and can be displayed for student reference throughout the year. Be sure to add coordinating products to accent your curriculum-based displays and create a cohesive classroom theme!